This week’s PhotoHunt challenge is Morning. I could rerun the photos I used for the recent themes Skies and Cloudy, but I decided this was the perfect opportunity to tell you about my Morning routine. When I first get up, I’ll go sit on the prayer rug on the windowsill and meditate. Sometimes I’ll do this before I have breakfast but usually I’ll do it aprés breakfast. Between sunrise and around 9 or 10 a.m., this is the only place to find sunpuddles in our condo. If I would have been around when they looked for a condo, I definitely wouldn’t have chosen one facing North. As I’ve been doing lately, I’d like to share a song for this theme. We must have a hunnert songs about Morning on the iTunes but this is TW’s favorite. The guys in Winter Hours are her friends who have even dedicated songs to her during their sets and thanked her in the liner notes of their only major label CD. Hmmm, I’d think I’d like someone to dedicate a song to ME. Unfortunately the singer, Joe, went OTRB way too early in 2003. This song made it to MTV. 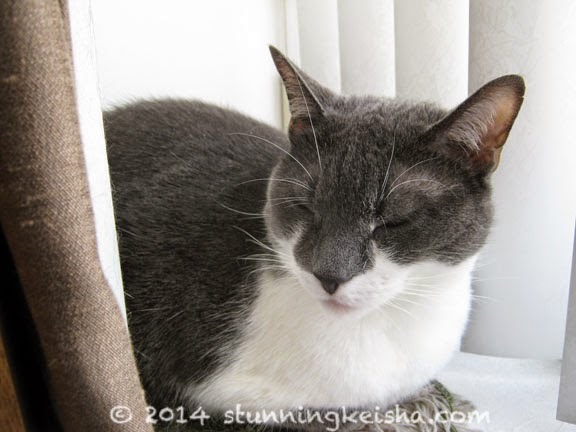 While you’re listening to that, I can share my entry in Athena and Marie’s Caturday Art Blog Hop. I didn’t do this in PhotoShop but we made it recently and I really think it’s cool. Pop said it looks 3-D. Stunning CKs in every color of the rainbow! Before I sign off today, I need to ax my BFGF Savannah what the hiss are you up to over there in Paw Tracks land? Sun puddles are hard to come by in our place too! I love your art - so many of you! Happy Caturday. I agree about helping the humans choose a cat-appropriate home. This one is ok, but it does not have the best sunpudddles. Your block art is neat, and it does look 3-D.
Beautiful art and nice song! What a lovely way to combine two blog hops! We love your rainbow CK!! CK you are looking quite zen in you photo my beautiful friend! Great piece of art work CK - very impressive indeed. I like to medicate on my perch in the East window every morning too for about 2 hours. Oh it feels so good. We totally love the artsy and musical CK! We only have a short sun puddle window of time here too. Morning, between 8-10am. I always call firsties. And then have to stand my ground...if you know what I mean. Love the rainbow pics, the more pics of your gorgeousness the better. Your morning routine sounds fabby. Just cause I'm tutored doesn't mean it isn't BIG. Ya look good in every color CK! 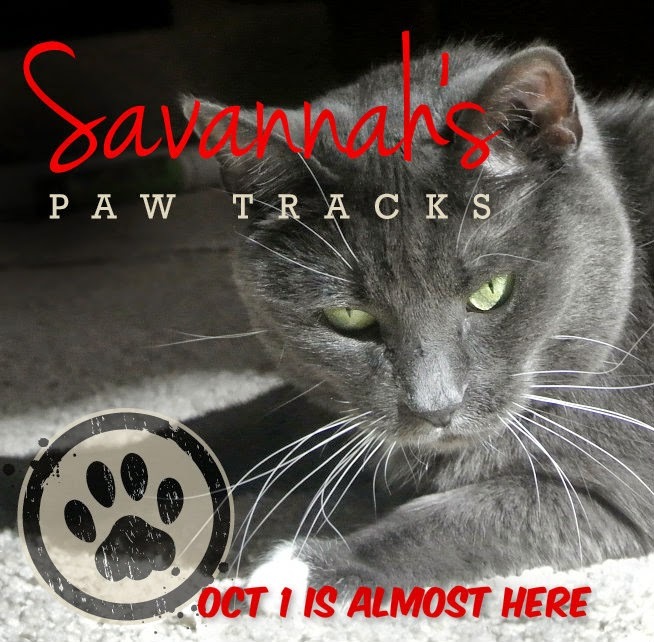 Ooh, Speedy the Cheeky house bunny posted about Savannah's paw tracks too. Gorgeous photo of you in the morning CK! CK, we love your art this week! So cool! Oh wow those awe sum gweat fotos. Luv da diffewent colowed yous. :) Hope yous havin a gweat weekend. I don't care that it was not done in Photoshop - your art today is so COOL! Great song, BTW, says my human! Look 3D & INFINITY ! Your mom has a talent ! You have quite the morning routine for sure, CK. Love the photo art of you, very cool! We see colours everywhere...ck's like a rainbow .... to paraphrase the song. Nice one. Have a serene and easy Sunday. The art image is so cool! It does look 3D! Sun puddles are plentiful around here BUT as our trees get bigger and bigger I'm noticing the puddles getting smaller and smaller....what's with that?! Nice caturday art. Have a great weekend. 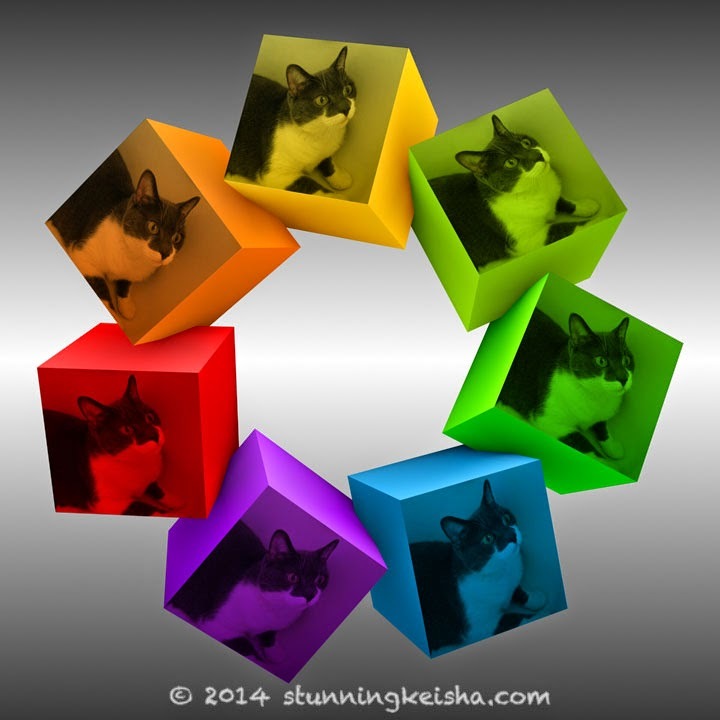 We love your pawesome 3D cubes! Very cool edit!!! Well done! I love the rainbow you CK! It's awesome. Sometimes you need a bit of colour - maybe to lift the spirits or stop us feeling down. Your picture made us feel better after a tough day.